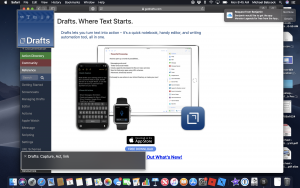 Looking for the best app for writing a book? This is the Second take of the official first episode of “App of the day”. Want to subscribe to just this section of the podcast? If so, simply add this feed to your podcast app of choice It’s been entireally way two long! Thanks to Convertkit for the 30% I get if you choose to pay them after clicking a link from one of my websites. In this episode, You’ll learn that whenever an idea comes to me it starts in my favorite IOS app called drafts and that it’s easy to start getting my idea into action Drafts lives in the bottom corner of my iPhone, so it’s always there. and not only that, but my content isn’t tied into one app so if you are looking for the best app for writing a book?, and you need a place to start writing then you should check this episode out. added benefit now is you can get drafts for free, so there isn’t an excuse for you to try it out I don’t think that Drafts is the only app you need to write a book, but I do think it’s the best app to start writing your book with. Just in case you didn’t know, or forgot, we chatted more about this app last year. In the episode titled DM6 – 2017 cool tools for MacOS and IOS. Interesting, I think that episode is the one that inspired this series of podcast episodes. If you got any value out of today’s episode, don’t forget to share with someone who is interested in looking for the best app for writing a book on IOS.